This is the Upper Gauley put-in as it was in the days immortalized by the lamentably late William Neely. Today the water is run through a penstock at the base of the dam to generate power. 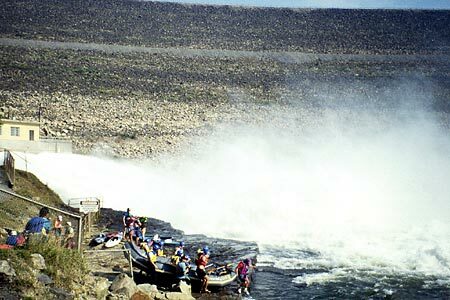 While the total flow is the same, the effect at the dam is much less dramatic. To learn more about the paddling icon who once described sleeping in the campground close to the base of the dam as like spending the night on a bed equipped with magic vibrating fingers on a cosmic scale, visit Goodbye William-Mr. December, The One and Only William Nealy, and In Full Candor.